Following the victory of the Syrian regime and their Hezbollah counterparts at al-Qusayr in early June 2013, Sunni extremist groups began conducting escalatory reprisal attacks against Hezbollah in Lebanon. In the months since, the predominantly Sunni Lebanese border town of Arsal, located directly across the border from the Qalamoun area where most of the surviving rebel fighters from al-Qusayr fled, has functioned as the primary staging area and support zone for these attacks into Lebanon. As a result, nearby Hezbollah strongholds in the Bekaa Valley are on high alert for potential car bombs and cross-border rocket attacks originating from elements in Arsal, forcing Hezbollah on the defensive in Lebanon. The Lebanese Army, meanwhile, has taken concrete measures to mitigate the threat posed by Syria to Lebanon via Arsal. Since the beginning of the Syrian conflict nearly three years ago, Lebanon’s Arsal, a lone enclave in the eastern Bekaa Valley for Sunnis sympathetic to the Syrian uprising, has served as a crucial logistical support network in the struggle against the Assad regime. Located in the northeastern corner of Lebanon on the border with Syria, the town lies nearly equidistant from Hezbollah’s Bekaa Valley strongholds of Baalbek and Hermel. 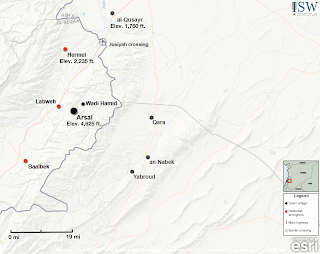 In spite of its isolated position, the geostrategic relevance of Arsal lies in its close proximity across the border from the contested Qalamoun mountain range. Qalamoun is an opposition stronghold in western Syria between Homs and Damascus that is currently the site of an intense battle for control of key supply lines along the M5 highway. Lebanese authorities have long neglected Arsal and the notoriously porous nature of the border region has made it a hub for smuggling people, weapons, and drugs across the border into Syria. 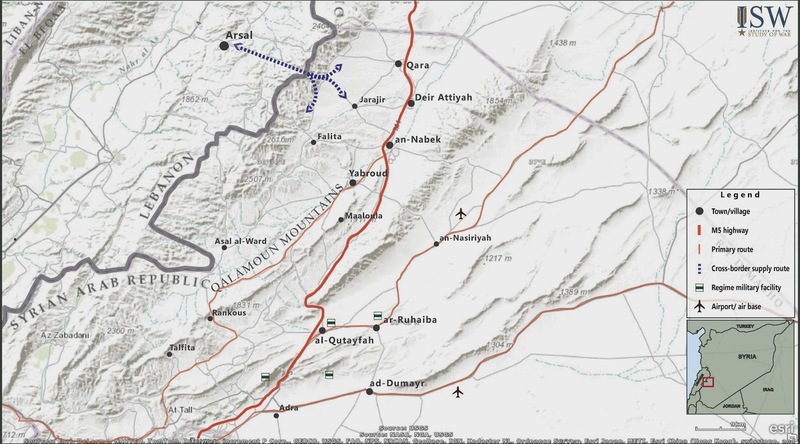 The smuggling routes through the connecting mountains flow freely in both directions, as weapons and fighters flow from Arsal into Qalamoun while car bombs and refugees flow in the opposite direction. Since the start of the Syrian conflict, Arsal’s pre-war population of 40,000 has more than doubled as 60,000 Syrian refugees have fled to the town due to the nearby fighting, according to municipality figures. In the past year, Arsal has become the primary staging area and support zone for Sunni extremist groups projecting violence into Lebanon. Left in its current state, Arsal threatens the interests of Hezbollah, the Assad regime, and the Lebanese government. The primary, short-term interests of these three parties align, as Hezbollah and the Lebanese government are keen on shutting down the flow of weapons and explosives through the border, while the Syrian regime looks to control the strategic central supply routes that dissect the country. Therefore, each group has a vested stake in disrupting the networks that run through Arsal. In the beginning of June, the Syrian regime achieved a decisive military victory following a 17-day siege of and clearing operation in al-Qusayr. Al-Qusayr is an important town in Homs province located adjacent to the Lebanese border, not far from the route that connects Damascus to Homs, which in turn links the Syrian capital to the Alawite heartlands along the coast. Many of the surviving rebel fighters from the assault fled south to the nearby Qalamoun region. This important regime victory six months ago was made possible by the large-scale involvement of Hezbollah fighters, whose overt presence in Syria prompted a series of reprisal attacks in Lebanon during the summer months that were likely linked to the logistical support hub of Arsal. In July and August, for example, Hezbollah’s Beirut stronghold of Dahiyeh came under attack on two separate occasions. The first, a car bombing in the Bir al-Abed area, injured at least 53. Caretaker Defense Minister Fayez Ghosn tied the attack to Arsal residents. The second incident, another car bombing, occurred in the Ruweiss district of Beirut, not far from Bir al-Abed, killing at least 25 while injuring over 200. Lebanese authorities linked this attack to many of the same suspects based in Arsal. Similarly, Ghosn attributed a spate of roadside bombings in June and July that targeted Hezbollah convoys en route to Damascus to elements in Arsal. As the summer months concluded, there was an escalation in two distinct trends of confrontation in Arsal, and neither shows signs of abating. First, the Syrian regime carried out a series of high-profile attacks against opposition targets inside Lebanese territory. On August 3rd, a Syrian regime airstrike killed nine, and injured nine more, including women and children, in Khirbet Daoud, just east of Arsal. Two months later, on October 7th, Syrian warplanes targeted an ambulance in the Wadi Hamid area of Arsal that was presumably transporting a wounded rebel fighter seeking refuge in Lebanon. Just a few days later, Omar al-Atrash, an Arsal resident and the suspected head of Jabhat al-Nusra’s Lebanese faction, was alleged to have been killed in a Syrian airstrike along with several others in Nehmat, near Arsal on October 11th. Al-Atrash was reportedly responsible for the August 15th Dahiyeh bombing. On November 15th, the Syrian regime, along with its Hezbollah counterparts, launched an operation aimed at retaking the Qalamoun area. As the tempo of the Syrian regime offensive on the rebels in Qalamoun continues to increase, so do the cross-border incidents. In mid-November, two Syrian gunships carried out a series of raids targeting the outskirts of Arsal in Wadi Atta and Hay al-Shamis striking several houses purported to be inhabited by opposition militants. In the following week, three more attacks targeted Arsal in a span of just ten days. In a rare responsive measure, the Lebanese Army fired anti-aircraft missiles at Syrian planes flying over Arsal on December 30th, reportedly responding to orders from the Lebanese Army Command to “fire on any warplane that violates Lebanese airspace.” These orders signify a departure from previous incidents, in which President Michel Suleiman condemned the violations but refrained from overt action to halt them. The reasoning behind the change in policy is unclear, but the timing of a change in the strategic perspective of the Lebanese government regarding Syrian airspace violations suggests that the Lebanese Armed Forces felt the need to display a more muscular response to a serious threat in the Bekaa Valley. The other noticeably intensifying trend occurring in Arsal is the number of confrontations between the Lebanese Army and Syrian rebels smuggling arms and explosives. On September 29th, the Army confiscated a truck from Arsal heading to Syria that contained two hundred 80mm mortar shells and an estimated 7,000 rounds of ammunition, which Lebanese officials ultimately determined was expired. Two weeks later, on October 14th, Lebanese Armed Forces defused a car bomb rigged with 50-kilograms of explosives in Beirut’s al-Maamoura district of the Hezbollah-controlled southern suburbs. Thirteen individuals, the majority of whom were from Arsal, were indicted for the plot and allegedly confessed to being a part of Jabhat al-Nusra (JN). The following week, a leaked security memo from the Beirut Airport alleged that JN rigged four vehicles with explosives and sent them through Arsal with forged documents, prepared for operations against Hezbollah strongholds. In perhaps the most high-profile attempt to smuggle explosives into Lebanon to date, on November 22nd, Lebanese Independence Day, security forces dismantled a car near Hezbollah’s Bekaa Valley stronghold Baalbek carrying 400-kilograms of explosives. For comparison’s sake, the explosives were nearly eight times heavier than the ones used in the Iranian Embassy suicide blasts in Beirut on November 19th that killed over 20 and injured more than 150. Authorities were alerted to the vehicle after reports of a shootout, and found the car with its front windows smashed and tires burst. Reports indicate that Hezbollah had monitored the car upon its entry into Arsal before confronting it and apprehending the passengers when it reached an isolated stretch of road just north of Baalbek, allegedly aware of its presence through the use of Iranian-made UAVs. If true, this would illustrate the substantial length to which Hezbollah is prepared to go to mitigate the threat posed by Sunni extremists in Arsal. Most recently, on December 17th, Hezbollah fighters intercepted an explosives-laden vehicle heading for one of its military bases outside of Labweh, a town just 10 kilometers from Arsal. The targeted base in the town of Sbouba is reportedly a station used by the organization for rotating its fighters in Syria. It is clear that Hezbollah military assets in the Bekaa Valley are on high alert, and in this vein, the organization has increased security measures in Hermel to protect its interests against further attacks. Notably, the U.S. and the U.K. have recognized the hazards posed by the porous, mountainous border with Syria, providing four-wheel drive vehicles with off-road capabilities and border-observation equipment and technology to the LAF. Similarly, the Lebanese Army itself has begun to take concrete measures to prevent the smuggling of weapons and explosives across the border. Army bulldozers constructed a 2.5-meter high, 25-kilometer long roadblock that stretches from Arsal to Ras Baalbek amidst reports of additional rockets and car bombs heading for Lebanese territory. Only a handful of Syrian rebel groups have used vehicle-borne IEDs, operate out of the Qalamoun region, and have the strategic resources and training to employ these devices. The recent announcement, therefore, from JN leader Abu Muhammad al-Jawlani about the formal presence of his organization in Lebanon, in conjunction with a Hezbollah ambush that killed 32 JN fighters near the outskirts of Nahle, just 30-kilometers away from Arsal, suggests that JN is the primary Syrian rebel group staging attacks from Arsal and its outskirts. Similarly, in mid-December, the organization jointly claimed rocket attacks on Hermel with the previously unknown Marwan Hadid Brigades. In retaliation for the increasingly public involvement of Hezbollah in the fighting in Syria, specifically right across the border in Qalamoun, it would not be out of the question to expect more frequent car bombings and cross-border rocket attacks against the organization’s interests in Lebanon, mirroring the trend witnessed after al-Qusayr. The southern suburbs of Beirut, Baalbek and Hermel in the Bekaa Valley, and towns in southern Lebanon like Nabi Sheet and Bint Jbeil are particularly vulnerable targets. With refugees fleeing Syria to enter Lebanon’s Arsal at an unprecedented rate due to the intensity of fighting in nearby Qalamoun, the aforementioned trends, confrontations between the Lebanese Army and Syrian fighters smuggling weapons and explosives, in addition to airstrikes against Syrian opposition fighters in Lebanon and potential responses from the LAF, will continue, and likely occur at an accelerated pace. Over 200,000 people live in the Qalamoun area, and as fighting spreads to the towns of Nabak and Yabrud, further displacement is expected. A potentially dangerous impact of Arsal’s refugee influx is implicit in Oxfam’s November 2013 report, Survey on the Livelihoods of Syrian Refugees in Lebanon. A prominent majority of the Syrian refugee population in Lebanon is under 30, living in squalid conditions while struggling to survive amidst harsh economic circumstances. Similar to the case of Lebanon’s Palestinian refugee camps, Arsal could become a major recruiting ground for Sunni extremists, if it has not already. Hezbollah’s involvement in the Syrian conflict remains undeterred in spite of incurring increasing casualties, including high-profile battlefield commanders. 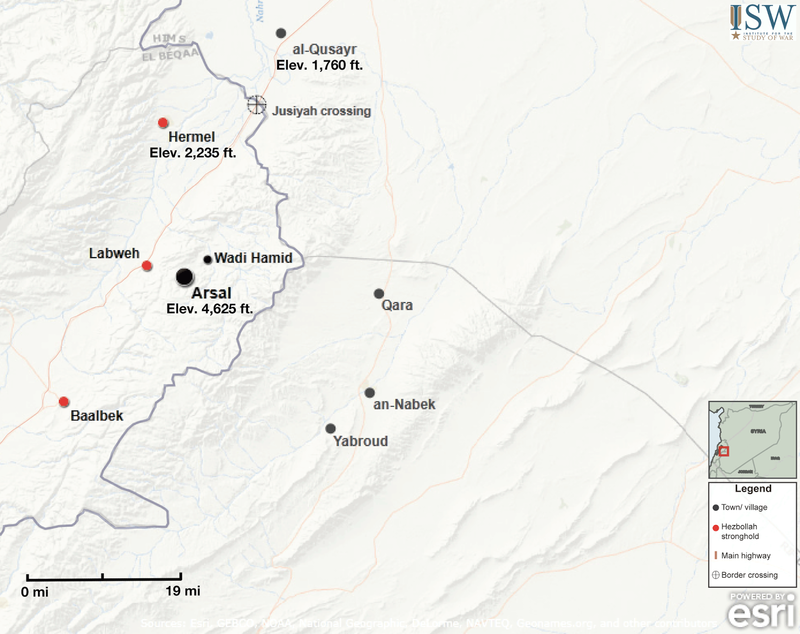 The uptick in attacks against Hezbollah in Lebanon facilitated via Sunni extremists in Arsal is undoubtedly directly linked to the overt, and increased, presence of Hezbollah fighters across the border. But, in the face of a greater perceived threat from Arsal, Hezbollah Secretary-General Hassan Nasrallah highlights the necessity for increased Hezbollah presence in Syria to mitigate the danger posed to Lebanon. With the Syrian war showing no signs of slowing and Hezbollah showing no sign of withdrawal, Arsal remains the primary staging and support zone through which JN and its allies will conduct attacks against Hezbollah in Lebanon. Should the Assad regime and Hezbollah’s operation in Qalamoun be successful, Arsal will effectively be cut off from its support line, leaving the some 60,000 Syrian refugees in the town surrounded by Hezbollah and regime soldiers. Whether the offensive is successful or not, given the demographic composition of Arsal, the town will continue to threaten the interests of the Syrian regime, Hezbollah, and the Lebanese government. Fighting between pro-regime and rebel forces has begun to concentrate on the Damascus-Homs supply route through the Qalamoun Mountains, which saw sporadic violence throughout the summer of 2013. This battle – which is crucial for both regime and rebel resupply – will focus on contested sections of the M5 highway. Hezbollah will also focus on cutting off logistical connections between Arsal, Lebanon, and rebels in Qalamoun. Although Hezbollah and the regime share a common goal of the regime’s survival in Syria, the battle for Qalamoun illustrates the potential for disparity in their strategic priorities. On November 25, the bodies of Iraqi Sunni tribal leaders Adnan al-Ghanim and Kadhim al-Juburi were discovered in al-Tannumah, Basra. According to reports, the two tribal leaders were shot in the head and chest and their bodies were disfigured. Furthermore, al-Ghanim was beheaded while one of al-Juburi’s legs was cut off. The discovery of their bodies follows their kidnapping on October 26, when al-Ghanim and al-Juburi were picked up in central Basra city by individuals in military uniforms. The family of al-Ghanim immediately described the operation as a “kidnapping” and al-Ghanim’s brother, Mohyi, added that it is intended to “displace the sons of the tribe.” Local authorities denied any involvement of security forces in the operation, and Basra’s police formed a special unit to search for and find al-Ghanim and al-Juburi. Adnan al-Ghanim was a significant personality in Basra. He was the leader of the al-Ghanim tribe in that area and was considered a prominent social and tribal leader in the south. His family resides in the Abu al-Khasib area in southern Basra. Abu al-Khasib has a sizable Iraqi Sunni population. In 2010, al-Ghanim was arrested by security forces on charges of supporting “terrorism.” He was subsequently released in 2012 after he was cleared of the charges. More recently, his house was targeted by a hand grenade attack on July 23. This history suggests that al-Ghanim has been a consistent target of attacks either due to his sectarian background or his social prominence. These events represent a renewal of sectarian targeting of Iraqi Sunnis in southern Iraq that culminated in September with the closure announcement of Sunni mosques in Basra by the Sunni endowment. The closure of the mosques coincided with the displacement of 150 families of the predominately Iraqi Sunni al-Sadun tribe in Dhi Qar. Basra is not the only location in southern Iraq that is witnessing attacks against tribal leaders. In Dhi Qar, the leader of the Rfei tribe, Jamal Mohsen al-Faris, was killed by unidentified gunmen in al-Fajr sub-district on November 25. Al-Faris is also an Iraqi Sunni tribal leader and former Iraqi parliamentarian, and his assassination demonstrates that the targeting of Iraqi Sunni tribal leaders in Iraq’s southern provinces is not an isolated phenomenon. Al-Ghanim and al-Juburi were likely kidnapped and killed by Iraqi Shi’a militias as part of a continued and renewed campaign of sectarian reprisal attacks. However, the allegations that they were kidnapped by individuals in military uniforms and with apparent impunity will make the local security forces appear complicit in the attacks. This perception will foster an image that the Iraqi Security Forces in Basra are targeting Iraqi Sunnis. Consequently, it is likely that members of the al-Ghanim tribe and other Iraqi Sunni tribes will be more concerned about their personal safety now and will consider leaving Basra and southern Iraq to safer places in Iraq. The killing of al-Ghanim and al-Juburi could also elicit sectarian reactions in the form of tribal retribution attacks by members of the al-Ghanim tribe and a push by al-Qaeda in Iraq to paint the killing as further evidence of targeting of the Iraqi Sunnis. For Basra, these high-profile killings also represent a possible turning point. The area where the bodies were found is known to have a militia presence. Therefore, the discovery of the bodies is a new signal that militias are able to operate with increased impunity in Basra. Given the high potential for the fallout scenarios described above, Iraqi Security Forces in southern Iraq have to pursue a strategy aimed at curtailing the activities of Iraqi Shi’a militias and providing visible, concrete steps for the protection of the Iraqi Sunnis. Ahmed Ali is a senior Iraq Research Analyst and the Iraq Team Lead at the Institute for the Study of War. Earlier today, a new merger of rebel forces was announced in Syria. While the seemingly endless string of mergers and splits among the Syrian rebels can be difficult to follow, this particular announcement is significant. The new Islamic Front has the potential to finally be the unified fighting force that the Syrian rebels have been waiting for. The seven rebel brigades that form the founding members of the Islamic Front include some of the country’s strongest groups. Ideologically they span the Islamist spectrum from those who have called for a modern, moderate state with a foundation of Islamic law, to those who have called for a state with strict interpretation of Sharia law and have at times appeared to have more in common with the al-Qaeda affiliates than with their fellow Syrian rebels. Suqur al-Sham – Suqur al-Sham was founded in 2011 and is based in Idlib province. It was a member of the moderate Syrian Islamic Liberation Front (SILF), which came under the umbrella of the western-back Supreme Military Council (SMC). The group’s leader, Ahmad Eissa, was named as the head of the new Islamic Front. Eissa has previously called for a moderate Islamic state that is not imposed on society. Though its forces are formidable, Suqur al-Sham is by no means the strongest brigade in this alliance, making the choice of Eissa as leader notable. The group has had recent trouble with the Islamic State of Iraq and al-Sham (ISIS). Liwa al-Tawhid – Liwa al-Tawhid is by most accounts the strongest group in Aleppo, estimated to have around 11,000 fighters. It was formed in July 2012 as a merger of smaller militias in the area. Although they have cooperated with the more extremist groups in battle, they have espoused a moderate Islamic ideology and were respected by other rebel groups. This was demonstrated in September when they were called in to mediate fighting between ISIS and an FSA-linked brigade in the northern city of Azaz. Their former military commander Abdel Qader Saleh had previously stated that he wants a modern Islamic state with a basis in Sharia law, but with civilian rule, elections, and minority protection. Jaysh al-Islam – Jaysh al-Islam, based in the Damascus area, was created in late September 2013 when Liwa al-Islam consolidated its power by subsuming dozens of other brigades. Liwa al-Islam had previously been a member of the SILF and therefore had fallen under the SMC’s umbrella, but made it clear that it was breaking completely with the SMC in its new incarnation. In recent weeks it has received criticism from ISIS for pulling out of several battles, pushing Jaysh al-Islam to make a public rebuttal. Ahrar al-Sham – Ahrar al-Sham was the leading member of the Syrian Islamic Front (SIF), an umbrella coalition of more hardline Islamic groups, unaffiliated with the SMC. Though it is still widely referred to as Ahrar al-Sham, the full name for the group is Harakat Ahrar al-Sham al-Islamiyya, which it took on in January of this year when Ahrar al-Sham consolidated several groups into one. Ahrar al-Sham is one of the more extreme Syrian rebel groups, and has a Salafi jihadist ideology. Its leader, Hassan Aboud has stated that democracy is a tool of the west and Sharia is the only acceptable option. This group frequently fights in close cooperation with both of the al-Qaeda affiliates in Syria, and has also been one of the few rebel groups to regularly hold al-Qaeda style advocacy tents, trying to win over the Syrian people to their philosophy. Ahrar al-Sham is also one of the few groups that operates on a national level and is strong on several different fronts. Ansar al-Sham – Ansar al-Sham was also a member of the SIF, and operates mainly in Latakia. It has not been as public with statements of its ideology as some of the other brigades, leading to speculation that it may not have a solid command and control structure among its various units. If its ideology can be gleaned from the founding charter of the SIF, it wants to topple the regime and create an Islamic state based on Sharia law. Notably, the charter does clearly state that the SIF's approach “is one of centrism and moderation. It is far from religious fanaticism and its resulting deviation of creed and action;” and makes specific mention of women’s rights. Although it is difficult to know how much of these words are aspirational rather than reflective of reality. Like Ahrar al-Sham, Ansar al-Sham has put some effort towards prosthelytizing and civil works. Liwa al-Haq – Liwa al-Haq formed in August 2012 as a merger of other rebel brigades in Homs, and was also a member of SIF. Its founders have claimed that is not a Salafi jihadist group, and its members have a range of ideologies (which is probably true for all of the brigades in Syria). It is one of the smaller groups in this alliance. Kurdish Islamic Front – By most accounts this is a very small fighting force, numbering less than 1,000 fighters. The Kurdish Islamic Front has fought with the al-Qaeda affiliates in Syria against the Kurdish YPG fighting forces. Coming on the heels of the recent announcement by the YPG of an interim Kurdish government in Hasaka – a move which was widely condemned by other rebels as an attempt to break up the country – the Kurdish Islamic Front’s inclusion in this new alliance is most likely a message to the YPG not to get too comfortable. Admittedly, Syria’s armed opposition has faced challenges in unifying in the past. The atomized nature of the rebel forces is a product of the organic roots of the Syrian uprising. But changes in the conflict have forced the rebels to evolve in order to survive. One result of this evolution has been the increasing drive for unification among the internal fighting forces, independent of the political leadership-in-exile which has failed to provide the amount of support that the fighting groups have so desperately needed. The increase in foreign elements in the conflict, on both sides, has accelerated this evolution. Smaller, scattered, local rebel brigades have been unable to compete with the al-Qaeda affiliates – particularly the Islamic State of Iraq and al-Sham – which have demonstrated the ability to operate at a national level. On the other side, this year has seen a tremendous influx of pro-regime foreign fighters in the form of Hezbollah members, Iraqi Shi’ite militias, and Iranian trainers and strategists. These forces have significantly boosted the strength and fighting capabilities of the regime, which was operating with greatly diminished strength as of the end of 2012. There have been a number of notable mergers among the rebel groups this year, particularly in the months since the August 21st chemical weapons attack. Some of those attempts have been successful, like Jaysh al-Islam, while others, like the September 24th Islamic Alliance, have fallen apart quickly. But with every attempt the rebel brigades have been learning important lessons about what they need to do to succeed in forming a larger rebel army, and the Islamic Front announced earlier today demonstrates this clearly. Notably, this group does not include either of the al-Qaeda affiliates in Syria. Also, in the announcement they were clear state that this was intended to be a full merger and not just another coordinating body. Both of these moves were intended to avoid the pitfalls that plagued previous mergers. After the creation of Jaysh al-Islam under Zahran Alloush on September 29th, it was clear that the western-backed Supreme Military Council (SMC) was in trouble. General Salim Idris reportedly cut short a trip to France to rush back to Turkey to try to salvage the SMC with a reorganization that would be more inclusive of local leaders and give Zahran Alloush a seat at the table. But eventually this initiative died out, and shortly afterwards the social media chatter about an imminent rebel alliance of the country’s strongest brigades began. Then came the death of Liwa al-Tawhid’s military commander, Abdel Qader al-Saleh, in a regime airstrike near Aleppo over the weekend. Al-Saleh was a well-respected, charismatic leader, and it was rumored that he would be named as the leader of the new alliance. The loss of Abdel Qader al-Saleh is doubtless a blow to this unification, but despite this setback it seems that the groundwork had been fully laid and with some reorganization behind the scenes, the brigades went ahead with their announcement and subsequent interview live on Al Jazeera. On one hand, this may be the nail in the coffin of the SMC. The western-backed umbrella group was wobbly enough after the resignation of a leading northern commander and the failed negotiations to bring Jaysh al-Islam back into the fold. With the additional losses of Suqur al-Sham and Liwa al-Tawhid it is hard to imagine that the SMC can now survive with any semblance of legitimacy or power on the ground. Additionally, the fact that it is an “Islamic” alliance and includes some of Syria’s truly hardline elements is worrisome, since it could mean that this new union will push the more moderate groups in that direction. 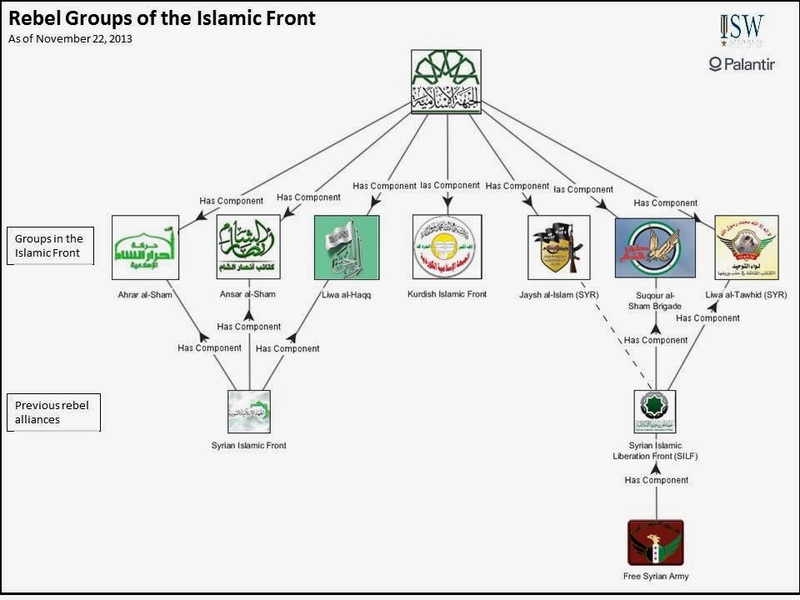 On the other hand, this new Islamic Front does not include either of the al-Qaeda affiliated groups in Syria. And as the Islamic Front has now set itself up as the most powerful rebel group in the country, it seems that they may attempt to sideline al-Qaeda and reclaim the Syrian insurgency. Around the same time of the merger announcement, Liwa al-Haq published a statement to clarify its views that seems to support this possibility. In the statement they say that while they appreciate ISIS for its support in fighting against the regime, they do not acknowledge the ISIS brothers as legitimate leaders for Syria. Additionally, the fact that Ahmad Eissa of Suqur al-Sham was named as the leader of the Islamic Front over commanders from more powerful brigades may be a sign that the Islamic Front will attempt to stay on the more moderate end of the spectrum. This new group will be built gradually over the next three months as the brigades work towards integrating their organizational structures. We can also expect to see more rebel units joining the Islamic Front in the coming days, as they have indicated that they are current reviewing requests from prospective members. If they start to announce the addition of other power players like the Farouq Brigades, the Furqan Brigades, and the Nour al-Din al-Zenki Battalions, it will be a good indication that the Islamic Front is here to stay. Even as it stands with the current members, the new group will have an estimated 45,000 fighters, and span critical battlefronts that including Damascus, Homs, Idlib, Latakia, and Aleppo. On November 3rd, the Kurdish People’s Protection Units (YPG) launched an offensive to consolidate its control of the Hasaka province by pushing al-Qaeda-affiliated Islamic State of Iraq and al-Sham (ISIS) and Jabhat al-Nusra (JN) out of the area surrounding the Turkish border city of Ras al-Ayn. The move came a week after the YPG, which serves as the armed wing of the Democratic Union Party (PYD) and the unofficial Kurdish security force, captured the city of Yarubiya on Hasaka’s border with Iraq. Hasaka, home to the majority of Syria’s oil reserves as well as a 70% Kurdish population, serves as the primary support base for the PYD. As a buffer against ISIS positions further west, Ras al-Ayn is essential to the PYD’s efforts to create a zone of peaceful Kurdish provincial autonomy amid Syria’s ongoing civil war. The YPG’s operation, dubbed the “Serekeniye Martyr’s Offensive,” was a quick success that resulted in the capture of 38 small villages and military positions in a 15 kilometer radius south and west of Ras al-Ayn. Assuming that the YPG fortifies these newly acquired positions, as it has dutifully done with other acquisitions throughout the conflict, these territorial gains will greatly enlarge the geographic barrier protecting against attacks from ISIS positions around Tal Abyad, in northern ar-Raqqa province. The offensive, currently in its third phase, has targeted ISIS and JN positions that previously served as launching points for shelling campaigns and raids on YPG patrols and checkpoints in Ras al-Ayn. The first phase of the offensive, which began November 3rd and ended November 4th, was a push southeast along Highway 716 towards Hasaka city. The second, which began November 4th and ended November 5th, focused on a push west along Highway 712, in the direction of Tal Abyad. The captured positions range from neighborhood-sized suburbs to outposts consisting of a few residential buildings on strategic roads or intersections. No information has yet been released on the objectives or status of the third phase. The success of the Serekeniye Martyr’s Offensive is indicative of the strength, discipline, and organization that armed Kurdish groups have exhibited throughout their clashes with al-Qaeda affiliates over the last six months. In July the YPG’s general command announce a change of military posture from “defense and protection” into combat mode, yet until the Serekeniye Martyr’s Offensive, the YPG had maintained a mostly cautious posture – repelling attacks, advancing conservatively, and holding new territory firmly. It is unclear whether this offensive was an isolated YPG surge aimed solely at consolidating control of Ras al-Ayn, or if it represents a broad shift to a more aggressive and expansionary YPG strategy. If the YPG is indeed changing its strategy, advances into Tal Abyad and further west will signal the shift. Comments by YPG spokesman Redur Xelil show that the militia plans to advance at least as far as the city outskirts. Any push further, into Tal Abyad proper, will indicate that the YPG in northeastern Syria intends to unite with its counterparts in the Aleppo border towns of Azaz and Jarablus. These cities further west are home to considerable minority Kurdish populations, but are predominantly Arab and currently controlled by ISIS and other opposition groups. Capturing and securing them would require a military operation of a scale that the YPG has not yet carried out. Another possibility is that the success and magnitude of the offensive was exaggerated by a coinciding strategic withdrawal on the part of ISIS and JN. Facing fierce YPG resistance, a decrease in Turkish support, and the loss of access to the Iraqi border crossing at Yarubiya, the al-Qaeda affiliates may have pulled back from Hasaka in order to reinforce against the ongoing regime offensive in Aleppo and bolster other strongholds in ar-Raqqa and Deir ez-Zor provinces. Although Xelil denied any such retreat, the fact that the YPG’s recent gains around Ras al-Ayn came so rapidly and with so few casualtieson either side, suggests some degree of surrender on the part of ISIS and JN, which are renowned for their fighting ability and unlikely to have been routed so abruptly. Given the al-Qaeda-affiliates’ apparent disadvantage in Hasaka – evidenced by their loss of Ras al-Ayncity and positionsnear Yarubiya as early as this summer – abandoning the province for more promising fronts would make strategic sense. The retreat hypothesis also comports with SOHR reports, as well as various social and mainstream media statements. Less than a week after the completion of the offensive’s second phase, on November 12th, the PYD announced the formation of an interim government in Hasaka. Initial reactions to this announcement from the Syrian opposition, Iraqi Kurds, and Turkey were overwhelmingly negative. Rebels, who have long accused the Kurds of collaborating with Assad, renewed their allegations of PYD betrayal, while foreign governments insistedthat the PYD could not unilaterally establish autonomy within a sovereign nation. Even other Kurdish groups – concerned over the concentration of power in the hands of the PYD – objected on the grounds that the announcement ran counter to Kurdish ambitions of a unified state that would comprise territories of Iraq, Syria, Turkey, and Iran. The PYD denies any relationship with the Assad regime and insists it supports the revolution and that its interim government would function as a regional body, operating parallel to a post-Assad Syrian government, and nothing more. For the moment, it seems that this debate will remain ancillary, as no acting parties appear to possess the energy, resources, and will necessary to challenge the YPG’s eminence in Hasaka. While the strength of al-Qaeda in Iraq (AQI) is clearly growing in Iraq and Syria, it is important to measure their status concretely. AQI emir Abu Bakr al-Baghdadi has expressed the goal to establish an Islamic emirate in Iraq and Syria. This goal depends foremost upon establishing control of physical terrain as a function of military strength. Following ISW’s October assessment of AQI’s pursuit of specific terrain in Ninewa province, this update will take inventory of the indicators elsewhere in Iraq that AQI is pursuing tactical control on the ground. This very concern was expressed on October 24 by Sahwa leaders in Kirkuk, warning that AQI wishes to take over towns and “hold terrain.” Achieving control of terrain in Iraq may be considered much harder for AQI than it is in Syria, given the Syrian context of prolonged civil war, state collapse, and wide population displacement. Therefore, observing their ground campaign in Iraq also provides a means to discern key aspects of their campaign plan, military organization, and effectiveness. The key indicators observed in southeastern Ninewa during the early months of AQI’s “Soldiers’ Harvest” campaign included leaflets and threats to the population instructing them to tolerate AQI or displace; attacks upon ISF facilities and convoys; and explosive attacks targeting the homes of the ISF in the area. Elsewhere in Iraq, these same indicators have also presented, carving an outline of AQI’s national footprint from which it might repel the advance of the ISF. Additional indicators of AQI’s advance include population displacement and sustained gun battles with the ISF, both of which have also occurred since AQI announced the conclusion of the “Breaking the Walls” campaign. This report will begin with the areas assessed to be historic support zones for AQI where they may first pursue tactical control. Population displacement in Iraq is a strong indicator of sectarian infighting. In some cases, it is also a strong indicator of AQI’s intent to move in to an area and establish control. Warnings of population displacement in Diyala first began to rise in July 2013 after a suicide bombing on a Shi‘a funeral in Muqdadiya, at the northern edge of the Diyala river valley. The displacement of Shi‘a and Sunni communities in Muqdadiya since that time have been mutual, with significant sectarian and security force mobilization. On October 7, Diyala officials estimated the displacement phenomenon in the province at 400 families, accusing both AQI and “the militias” of responsibility. The “militias” are likely a reference to Shi‘a militia groups. Diyala, like Baghdad, is a mixed Sunni and Shi‘a province. Communities and political alliances cross sectarian lines. This makes the province particularly valuable for AQI to destroy Iraqi social fabric and to incite sectarian violence, facilitating their movement in the area. The potential rise to arms of Shi‘a militias in Diyala significantly raises the stakes for their mobilization in Baghdad, particularly if Shi‘a neighborhoods are being overrun by AQI. Furthermore, it demonstrates AQI’s campaign success. In June 2012, before the start of AQI’s “Breaking the Walls” campaign, AQI spokesman Abu Mohammad al-Adnani indicated Diyala’s strategic significance in a speech. He expressed that where Fallujah had been the spark of the war against the West, Diyala would be the “spark” of the war against the Rafidha, a derogatory reference to the Shi‘a. With this speech in mind, it is likely that Diyala has been a focus of AQI’s resurgence for over a year, such that contemporary motion to displace populations from the provincial capital may be regarded now as a grave sign. Likewise, AQI’s VBIED attack upon a mosque hosting a joint Sunni-Shi‘a prayer on September 13 demonstrates AQI’s enduring focus upon the sectarian theme. AQI’s recent activities in the provincial capital of Baquba indicate their advance from this point toward Baghdad. On September 30, eight families in the Tahrir neighborhood of west Baquba received threats from AQI and displaced to a northern district of Baquba. On October 1, 30 families from the Shi‘a Shammar tribe also received threats, likely from AQI, to displace from the Gatun area of northern Baquba. On November 4, AQI distributed leaflets in several locations across Diyala warning Shi‘a against religious practices during the month of Muharram, leading up to the Ashura. This represents an escalation of the AQI threat in the province, further underscored by a recent attack on November 3 against a police headquarters in Baquba. The attack reportedly involved at least two successful VBIEDs as well as additional SVESTs, VBIEDs, and IEDs reported by the provincial police chief, General Jamil al-Shamari, to have been successfully dismantled. A shift in attack patterns to target ISF headquarters rather than civilians or ISF patrols is another sign of AQI’s increased strength in Diyala. During the month of Muharram, it is likely that AQI will regard Diyala as a main effort. How their operations in Diyala relate to their operations in other provinces and also in Syria will lend further insight into the degree of sophistication of AQI’s military bureaucracy. The last major ISF operations reported in Diyala occurred during the “Revenge of the Martyrs” campaign in September 2013. The fighting, however, escalated before that in April 2013. Fighting between the ISF and armed gunmen was most intense in Qara Tapa and Suleiman Beg, and gunmen briefly took control of the latter town. Since then, little has been reported of the ISF response to AQI in Diyala. On October 17, the ISF in Baquba announced the implementation of a plan to stop the forced displacements at the hand of AQI, involving increased cooperation between the Sahwa and the ISF. Additionally, on October 22, the Tigris Operations Command (TOC) moved in to augment the ISF west of Baquba, replacing the 19th Brigade of the 5th Infantry Division of the Iraqi Army and the 4th Regiment of the Emergency Police. This affirms that AQI’s advance in Diyala is drawing significant operational response from the ISF, and that this historic zone of control may be re-opened by AQI. As reported previously, AQI has also used leaflets and threats to shape conditions on the ground in Ninewa province. On September 17, flyers marked with the seal of AQI were discovered in Shura, threatening civilians who work for the government. On September 24, AQI issued a statement on ISIS signature letterhead urging the Ninewa tribes to stop working for the ISF. This technique has also been observed in othe­­­­­­r provinces. On October 3, 20 Sahwa in Salah ad-Din province indicated the intent to disband after receiving threats from armed groups, presumably AQI. This follows the assassination of Baiji Sahwa leader Monen Adnan Hamid. Additionally, on November 2, shop owners in the southeastern Baghdad area of Jisr Diyala reportedly received threats from AQI if they did not displace. Baiji is key terrain for Iraq’s oil industry, the site of a major refinery, and Jisr Diyala is a historic control zone for AQI that also witnessed sectarian violence during 2006-2007. These events indicate the expansion of AQI’s latest messaging campaign, communicating to various constituencies from a position of increased lethal power. A resurgence of HBIEDs has also been observed in recent months. Whereas HBIEDs had been used by AQI in previous years as booby-traps to injure security forces conducting raids, they now appear to be part of AQI’s intimidation campaign against the ISF. The homes of the ISF themselves are the new target of these attacks. On September 16, 22 houses belonging to ISF personnel south of Mosul were targeted with HBIEDs. On September 17, another six houses in the same vicinity were evacuated and detonated. On October 4, ISF elements interdicted a small team reportedly planning to destroy houses in the vicinity of Kirkuk. On October 9, 18 ISF homes in southwestern Kirkuk were blown up. Additional HBIED attacks against ISF members occurred south and west of Kirkuk on October 29 and November 1 and in Ninewa on October 18. On October 27, six houses under construction and belonging to ISF members were destroyed in western Tikrit. While the intent to intimidate the ISF through HBIEDs appears to be radiating from the Za’ab Triangle north of Baiji where Ninewa, Kirkuk, and Salah ad-Din provinces meet, the technique has been seen before. This year, on September 3, Shi‘a families in Latifiyah were targeted by HBIEDs. In this case, the families were executed first and their houses blown up afterwards. The HBIED campaign against ISF, however, thus far appears to be a largely nonlethal effort, focused upon the destruction of personal property. It is possible that AQI is using this tactic to weaken the ISF in place, though the direct connection to a campaign for territorial control is not yet clear. It is likely that the Za’ab Triangle, a historic support zone for AQI, is a source of consolidated strength for the organization rather than new territory. An alarming attack trend prosecuted by AQI to a greater extent recently is a complex attack upon a fixed site, such as an ISF headquarters or an oil field. This tactic had been used effectively during the 2012-2013 “Breaking the Walls” campaign in order to attack prisons. Some of the attacks have been explosive-based complex attacks. On September 29, the General Security Directorate in Irbil was attacked with an SVBIED and four suicide bombers and finally an ambulance-borne SVBIED. On October 1, the ISF claimed to have foiled an attack against the Directorate of Explosive Ordinance Disposal in Tikrit involving three suicide bombers. On October 22, two VBIEDs detonated on the Federal Police headquartersin Jurf al-Sakhar, northern Babel province. On November 7, an SVBIED targeted the Iraqi Army headquarters in Ana, western Anbar. On October 25, the headquarters of the Ninewa Operations Commandand Federal Police in Mosul were targeted with a VBIED and suicide bombings. In other cases, the attacks involved tactical ground assaults with small arms. On September 17, gunmen attacked the Tahadi police station in southern Fallujah with small arms and two SVESTs. On September 25, gunmen attacked the Municipal Council of Hawija with two SVBIEDs and small arms. On October 12, gunmen attacked the headquarters of the 51stBattalionof the Iraqi Army in southern Mosul. On October 16, gunmen attacked the ISF headquarters in Shirqat, north of Tikrit. These attacks are significant because they indicate clearly that AQI is attempting to displace the ISF or challenge their control, beyond merely attacking civilians to demonstrate their inefficacy. There have also been several prolonged attacks. The first occurred in western Anbar on September 24. Gunmen attacked ISF personnel in Ana and Rawa and sustained fire overnight, establishing control over these areas briefly. The gunmen also destroyed the al-Fhemi bridge linking Rawa and Ana during this time. AQI’s presence in this area is likely still robust, based upon ISF reports that AQI decapitated 14 Iraq Police personnel on October 23 in west Anbar and recent attacks against power lines between Ana and Haditha. Another major ground assault occurred at this time on October 21 in Fallujah. Gunmen attacked the IP Directorate, the Power Directorate, the Real Estate Directorate, and security checkpoints in the city. The attack involved small arms fire and mortars followed by three SVESTs. The gunmen seized the Power Directorate building, and it took the Iraqi Police nine hours of sustained fighting supported by Iraqi Army (IA) helicopters to retake the building. With these two attacks, it becomes apparent that the AQI footprint in Anbar is strong enough that AQI’s ground forces can move to fixed locations, engage ISF elements, and hold terrain briefly. This indicates not only the re-establishment of local security battalions within AQI’s military that can execute organized ground assaults, but also their intent to establish military control by ousting the ISF from hardened positions. The ability to sustain prolonged engagement with the ISF has also been seen in northern Babel province. On October 8, the “Scorpion” Special Forces unit moved into Jurf al-Sakhar and clashed with 300 AQI gunmen. In this case, the attack was initiated by the ISF, but the act of repelling ISF forces may indicate that this area is already under AQI control. The ISF reported around this time the discovery of an AQI training camp and a VBIED factory in the vicinity, an area that had been a safe haven for AQI in 2006-2007. These incidents correspond with the early September 2013 reports of HBIEDs and population displacement in nearby Mahmudiyah and Latifiyah. ISF reports of activities in this area have continued into November, suggesting that this terrain is still actively supporting AQI activities in Babel and Anbar provinces. The fact that several of these AQI control indicators have presented in multiple provinces raises the question of operational sequencing. Does one style of attack consistently precede others? Are these attacks scattered and random, or do they illustrate campaign planning? The case of Jurf al-Sakhar in northern Babel generates a compelling hypothesis. First, ISW assessed that Mahmudiyah may have emerged in early 2013 as a renewed VBIED control node for attacks in Baghdad. Second, the complex attack upon Abu Ghraib prisonoccurred on August 21, 2013 west of Baghdad, just north of this area of Babel province. Third, HBIEDs and population displacement occurred in Mahmudiyah and Latifiyah in September 2013. Fourth, sustained offensive attacks upon ISF positions in Fallujah, Ana, and Rawa in Anbar occurred in September-October 2013, potentially launched from Jurf al-Sakhar. Fifth, sustained defense of the main control position in Jurf al-Sakhar was witnessed when ISF elements moved to engage in the same area. 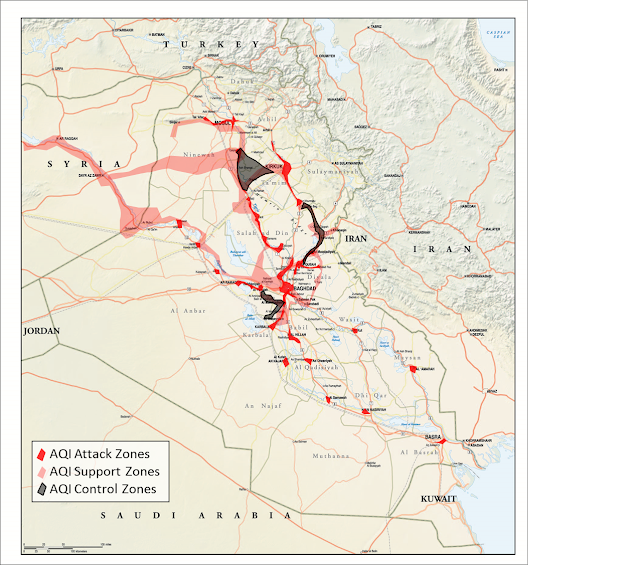 If we look to other historic support zones, like the Za’ab Triangle and northern Diyala province, and scan for indications of VBIED control nodes, HBIEDs, and population displacement, we may begin to see that recent AQI offensive activities cluster at a reasonable distance from these areas. This is an early hypothesis, that AQI’s ground assaults are a function of their established control of terrain, and it may be tested by observing where next AQI projects ground assaults upon ISF headquarters in November 2013. At this time, it is likely that the Za’ab Triangle, northern Diyala, and northern Babel province are among the zones in Iraq where AQI is exercising control. We may therefore next see attacks project upon ISF positions in Baiji at the southern tip of the Za’ab Triangle and Samarra in southern Salah ad-Din province, as a western expansion of the Diyala corridor. The plan of attack to counter AQI should orient around the three aforementioned centers of gravity once effective provisions for security in Iraq’s major cities have been established. It is important to recognize that Baghdad, Mosul, and Kirkuk are still attack zones, and AQI will achieve success if militant groups of any persuasion seize control of neighborhoods in these cities. It is lately visible that security response to attacks in Mosul has escalated. The ISF in Mosul increased defensive measures after the Ninewa Operations Command (NOC) sustained attacks on October 25. These measures included closing all five bridges in Mosul. Likewise in Baghdad, the campaign of VBIEDs targeting Shi‘a neighborhoods has continued unabated. Since the first VBIED wave of the new AQI “Soldiers’ Harvest” campaign on August 29, there have been six additional VBIED waves in Baghdad, on September 3, September 17, September 30, October 7, October 17, and October 27, roughly the same pattern reported previously, in addition to a sustained VBIED activity elsewhere in Iraq.The sustained pattern of independent VBIED attacks throughout this period underscores the assessment that the VBIED command lies apart from AQI’s security battalions in terms of operational control. The integration of VBIEDs into some ground assaults indicates combined arms operational design by a higher headquarters. It is therefore likely that the VBIED campaign in Iraq will continue in Baghdad and push further south, continuously exploiting the sectarian vulnerability. 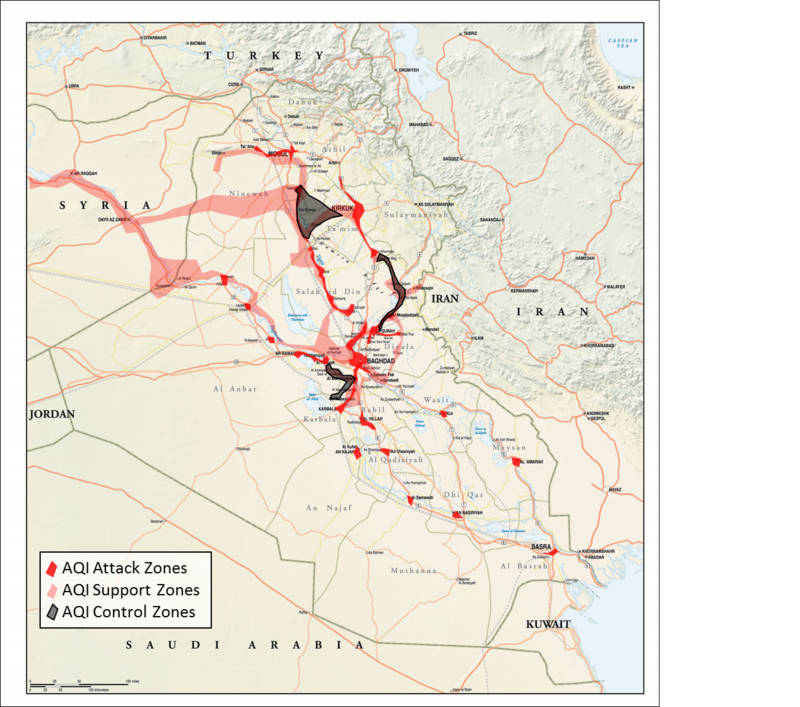 Elsewhere, it appears that AQI has now oriented its offensive lethal campaign primarily against ISF positions, launching from specific zones of established control, such as the Za’ab Triangle, northern Diyala, and northern Babel province. Looking ahead, in the provinces and in major cities, AQI will also likely continue to target Sunni citizens and community leaders across Iraq to deter political engagement, limit competing influence, and increase deprivation. The Iraqi government’s campaign to counter AQI must protect the whole population in order to secure its support and to mitigate AQI’s pursuit of terrain control. For more information on the VBIED waves mentioned in this report, please contact the author. Regime elements overran the city of as-Safira on Friday, November 1st, after a siege and bombing campaign that lasted more than three weeks and drove more than 100,000 civilians from the city. As-Safira, located only 15 km southeast of Nayrab Air Base (co-located with Aleppo Int’l Airport), is a key point along the regime’s only usable ground supply line from Hama and also houses some of the largest chemical weapons production facilities in the country. After taking the city, regime forces continued to push northwest toward Aleppo, and appear poised to open a supply line to the embattled Nayrab Air Base. In addition, the regime may attempt to alleviate the siege on nearby Kuweiris Air Base, located almost 30km east of Nayrab Air Base, which has been ongoing for months. One of the principal factors that contributed to the rebel defeat in as-Safira was a lack of coordination. This is evidenced by the recent resignation of Colonel Abdul Jabar Akidi, the Supreme Military Council’s top leader in Aleppo and the head of the FSA-affiliated Safira Operations Room. After the city fell, Col. Akidi issued a scathing video statement in which he accused the National Coalition of failing to support his command adequately and blamed a number of rebel groups for seeking to hold captured territory rather than coming to defend as-Safira itself. The Safira Operations Room echoed Col. Akidi’s sentiments, saying rebel groups failed to deploy enough fighters into as-Safira and singling out the Islamic State of Iraq and al-Sham (ISIS) in particular as not having a single fighter inside the city. Jihadist sources pushed back against this allegation and instead blamed other groups for surrendering as-Safira, highlighting further the disunity present among the rebels. The fall of as-Safira, which had served as a rallying point for a number of rebel groups in the region, including powerful Salafi group Ahrar al-Sham and al-Qaeda affiliate Jabhat al-Nusra, is a major blow to the rebel campaign in southern Aleppo province. By controlling as-Safira and accompanying villages along the road to Hama, rebels had made regime resupply from its southern strongholds nearly impossible, and if the regime is able to hold onto its recent gains it could threaten rebel positions in Aleppo province as a whole.